Gain brings joy to New York neighborhoods’ daily laundry experience with the help of Latin Grammy nominated singer Leslie Grace, Portraits of Hope and the community! In addition to experiencing the art and pop-up concert, residents also had the opportunity to take “selfies” within the art installation and enter to win the Gain #MusicToYourNose Instagram Sweepstakes, which runs through June 16, 2014. Brand ambassadors were also on hand to giveaway free Gain Flings! – the newest Gain detergent product to be introduced to the market. The single use detergent pacs provide a three-in-one benefit of Gain Detergent plus Oxi Boost and the malodor removal of Febreze. Yahoo en Español and Sony Music Latin also helped amplify these local efforts through the creation of an exclusive video series to be featured on a custom section of the Yahoo Mujer page titled, “Se Feliz.” This section on Yahoo en Español will profile community and music inspirations that bring joy, color and vibrancy to our lives. In addition to articles, slide shows and editorial blogs, “Se Feliz” will host an eight part video series featuring Leslie Grace, including video footage of a performance event and Portraits of Hope makeover reveal of a Laundromat in Grace’s hometown in the Bronx. Select pieces of that content will also live on ilovegain.com/flings. For more information about the Gain #MusicToYourNose Laundromat Takeover, please visit www.ilovegain.com/flings, on Facebook at www.facebook.com/Gain; on Twitter at @Gain or @GainLatino; on Instagram at @GainLaundry or by following #MusicToYourNose or #MusicaParaTuNariz. For more details on the Instagram contest, visit http://bit.ly/1qxBOEY. 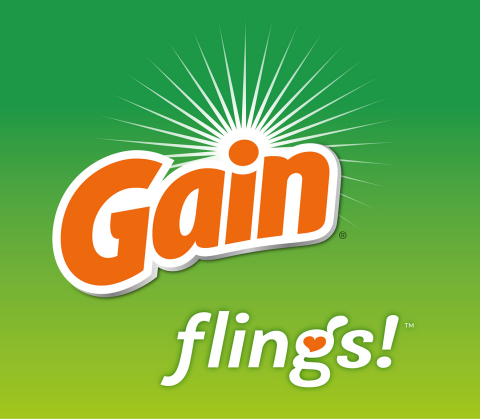 Gain launched new Gain flings! earlier this year. The new single-use laundry pacs not only deliver better cleaning versus Gain liquid detergent with added Oxi Boost and malodor removal power of Febreze, but provide consumers with the best Gain scent experience yet. In fact, a Gain commissioned study, conducted by scent expert Dr. Alan Hirsch and Innerscope Research, proved that the scent of Gain flings! can give you more joy than listening to your favorite music and it also can make listening to your favorite music more enjoyable. For more information on Gain Flings! visit www.ilovegain.com/flings. Gain detergent is currently available at drug, grocery and mass stores. With detergents and fabric softeners, dryer sheets, dish washing liquids, scent boosters, dryer bars and more, Gain will fill every room in your home with scents that are music to your nose. For more Gain laundry fun visit IloveGain.com/flings, http://www.youtube.com/Gain or follow Gain Laundry on Facebook and Twitter. P&G serves approximately 4.8 billion people around the world with its brands. The Company has one of the strongest portfolios of trusted, quality, leadership brands, including Always®, Ambi Pur®, Ariel®, Bounty®, Charmin®, Crest®, Dawn®, Downy®, Duracell®, Fairy®, Febreze®, Gain®, Gillette®, Head & Shoulders®, Lenor®, Olay®, Oral-B®, Pampers®, Pantene®, SK-II®, Tide®, Vicks®, Wella® and Whisper®. The P&G community includes operations in approximately 70 countries worldwide. Please visit http://www.pg.com for the latest news and in-depth information about P&G and its brands. Portraits of Hope is a non-profit that develops one-of-a-kind motivational art projects that merge the production of dynamic public art works with creative therapy for hospitalized children and civic education for students of all ages.